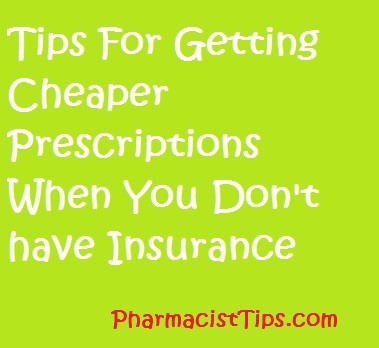 How are you supposed to afford prescription medications when you don’t have insurance? Is there a discount available to make the prescription cheaper. This is something we deal with on a daily basis at the pharmacy. Medications are expensive and sometimes they are too expensive – even when you have prescription insurance. I will outline some strategies I’ve seen people use to get their meds at a lower price. 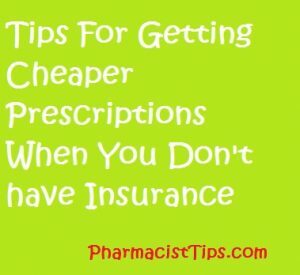 With some planning you can save money at the Drug Store. Call ahead and ask the pharmacy the cash price of the medication. Or, better yet get a copy of the discount generics your pharmacy offers and take it with you when you go and see the doctor. Let the health care provider know you have a pretty tight budget for prescriptions and you’d prefer they prescribe something affordable. Most pharmacies will have this printed out, just ask for it. Or, many chain pharmacies have the list available on their website. 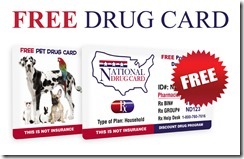 The savings with a discount card varies greatly by medication, I have a discount price checker here. The pharmacy can only use one discount card for you, just print one out and take it with you. Typically medications already on a $4 list will not be any cheaper with a discount card. With the list in hand you and your prescriber should be able to find a reasonably priced medication. It your condition requires a medicine not available in a generic or it simply expensive there are other options. Talk to your pharmacist. We pharmacists are pretty good about finding affordable alternative for patients. Make sure you really need the medicine. Ask your doctor if taking the medication is still needed, it is possible some conditions generally clear up on their own. Also, ask about possible dietary and lifestyle changes that could improve the condition and possibly reduce or eliminate the need for medicine. There are plenty of programs available to people who need expensive medication and can not afford it. Rx Assist has a database of programs available. Visit their website to search medications for available programs. PPA also has an option to search specific medications. Get discounts on AstraZeneca medication. Certain income restrictions apply. See a list of the medications. This is GlaxoSmithKline’s program for Medicare Part D participants. Visit the website for covered drugs and details. Program for those without prescription insurance and must meet certain income requirements. Visit the website for a medication list of GSK products and other details. Brand name Eli Lilly medications. It is for those without insurance and that meet certain income requirements. See a drug list here. A program covering brand name Merck medications. Income and insurance status requirements exist. Visit the website to see covered medications. Like other programs there are income and requirements. Visit the website for complete details.